It’s the oldest rule in the crossover book: if two disparate heroes or groups of heroes are going to team up, it’s only after they tussle with each other first. The Batman/TMNT series has just had its own clash, and not only is it a great fight, it’s a perfect example of why this crossover has been a blast to read so far. Minor spoilers ahead for Batman/Teenage Mutant Ninja Turtles #2, by James Tynion IV, Freddie E Williams II, Jeremy Colwell, and Tom Napolitano. Part of what’s made this series so fun even with just two issues down is James Tynion IV’s almost gleeful balance of the self-seriousness of Batman and the world of Gotham with the happy go-lucky hijinks of the Turtles. This is a crossover comic that both takes itself seriously for the purpose of the story and yet, at the same time, revels in the fact that it’s a goofy crossover series, more than happy to tick off the mandatory checklist of “things that crossover titles must do” with an earnest abandon that means, even if it’s hitting a lot of familiar beats, you can’t help but love it for doing so. The fight at the opening of this second issue is one of those familiar beats—but it’s such a great moment you know you’re in for a treat the moment it starts. Williams II’s bold, chunky art style has a great sense of movement to it, and seeing as this is a fight that’s basically an excuse for Batman to show off, deftly disarming and incapacitating each Turtle with ease, it’s kind of amazing how much subtle movement he captures with his relatively beefy take on Batman. 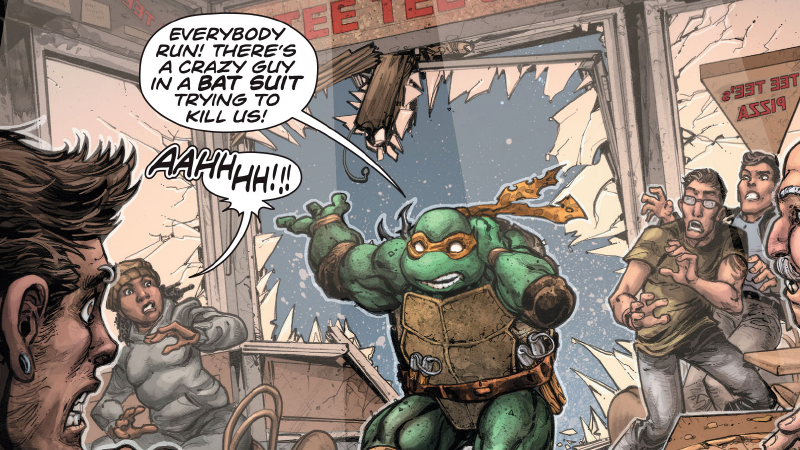 He’s a burly fighter, but with an agility that defies even the Turtles—and with minimal dialogue, it’s a moment where his art really gets to shine in a great way. Even though comic books don’t need an extra moment to remind you that Batman is awesome, this one-sided fight works mainly because of the reaction from the Turtles when they regroup. Even though they got resoundingly whooped by the Dark Knight... they kind of love him for it. They start drawing up charts of what makes Batman awesome (rad suit, little throwy things, capes, electro car) and not-awesome (the fact he beat them up, a “mean voice,” and that he stole Michelangelo’s sai), and being fascinated by him. Which makes total sense, because Batman’s perfection and ability to beat any foe with his detective skill is sometimes taken to a ludicrous excess—and the Turtles themselves after all, were initially a piss-take inspired that by that self-serious excess that came from characters like Batman or Daredevil, or series like Ronin, when Kevin Eastman and Peter Laird made them. They’re mutant turtle ninja guys who love pizza and fighting crime. Of course they love the idea of a billionaire running around in a bat suit with fancy gadgets. It’s as ridiculous as they are! This encapsulates everything that is making Batman/Teenage Mutant Ninja Turtles so fun to read so far—it’s not afraid to treat its “badass” moments seriously, but equally unafraid to poke at it for a whole lot of fun.